In recent months, a number of our clients have discovered that they can’t obtain insurance for the house they are about to buy, because it has knob and tube wiring. No insurance-no mortgage. No mortgage-no real estate transaction. Needless to say, we have had a number of concerned home buyers and realtors calling us to find out why we said the house was OK and yet the insurance company says it’s not. It requires two wires (normally a black one and a white one) to create a circuit. With modern wiring, these two wires (along with a ground wire) are bundled together in a single plastic sheathing. Older knob and tube wiring was installed so that the black wire and the white wire ran separately. It was installed in houses up until about 1950. 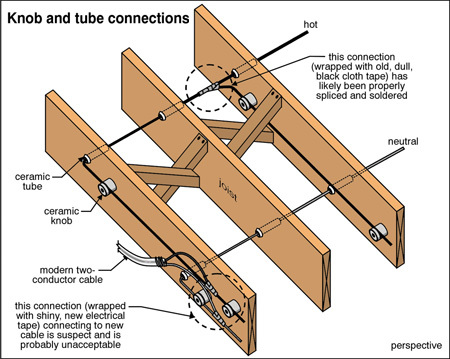 Modern wiring runs directly through holes in the structural components (such as floor joists). Knob and tube wiring used protective ceramic tubes placed in the holes to prevent the wire from chafing against the woodwork. Modern wiring uses staples to hold the wiring against structural members. Knob and tube wiring used more elaborate ceramic knobs to clamp the wire to the structural member. Connections between modern wires are completed within enclosed junction boxes. Knob and tube wiring had visible connections. The wires were spliced and soldered together and then wrapped with electrical tape. Ceramic knobs were used to secure the wires so that anyone inadvertently tugging on the wire would not be tugging on the electrical connection. Modern wiring is typically #14 gage copper wire and capable of handling 15 amps. Knob and tube wiring is often #12 gage copper wire and can handle 20 amps. Note: Even though some knob and tube wiring is capable of handling 20 amps, we suggest that it be protected by 15 amp fuses because, in all likelihood, some modern #14 gage wire may be connected to the older #12 gage wiring. From the above description, it becomes pretty obvious that knob and tube wiring is not necessarily dangerous. Knob and tube wiring which was installed properly, and has not been abused, can provide many more years of service. The biggest problem with knob and tube wiring has nothing to do with the original wiring. It has everything to do with what has happened after the fact. Most old houses do not have as many electrical circuits as new houses. If a circuit became overtaxed and 15 amp fuses were constantly blowing, some ill informed home owners would put in 25 or 30 amp fuses to “solve” the problem. Allowing 25 or 30 amps to flow through a wire which was not intended to handle that much electricity, causes the wire to overheat. This can cause the wire and the insulation to become brittle. Some home owners also decided to add additional outlets in the house and tie the new outlets into the old wiring. 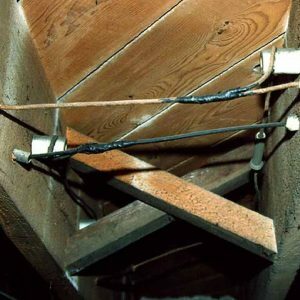 Instead of making proper connections which are soldered and appropriately protected, many home owners did their own sub-standard work. They would get out the pliers and a paring knife and whittle away at the wires until a connection was made. Instead of wrapping the connection with proper electrical tape, they used hockey tape, masking tape, scotch tape or even band-aids. It is wiring that has been abused that is potentially dangerous. Knob and tube wiring, on its own, is not inherently a problem. Some would argue that knob and tube wiring does not have a ground conductor. We would remind them that even modern wiring installed between 1950 and 1960 does not have a ground conductor. A ground conductor is necessary if you are plugging in appliances that have a 3-prong plug. If however, the knob and tube wiring is restricted to bedrooms, living room, dining room, et cetera, this creates no special hazard. Plugging a two prong lamp, TV, or clock into an old two prong outlet is just as safe as plugging them into a grounded outlet. We feel that the insurance companies’ rejection of knob and tube wiring is a knee jerk reaction reminiscent of the immediate reactions to UFFI and aluminum wiring. We are hoping that the insurance industry will realize that this is not a black and white issue (no pun intended) and that the mere presence of knob and tube wiring does not, in itself, create a hazard. We feel the same way about 60 amp services, but that’s another story.